There are at least two races or sub-species of the Rock Sandpiper. These being the Pribilof Rock Sandpiper and the Aleutian Rock Sandpiper. Both species are similar in size, body profile may make the Pribilof species seem more chunky and heavier. The Aleutian species has a darker plumage in both breeding and in non-breeding seasons. Showing a duller reddish-orange back and a darker face in the summer months and a noticeable darker grey body in the winter period. The Rock Sandpiper is probably the hardiest member of the sandpiper family and can still be seen in the northern regions of the continent. 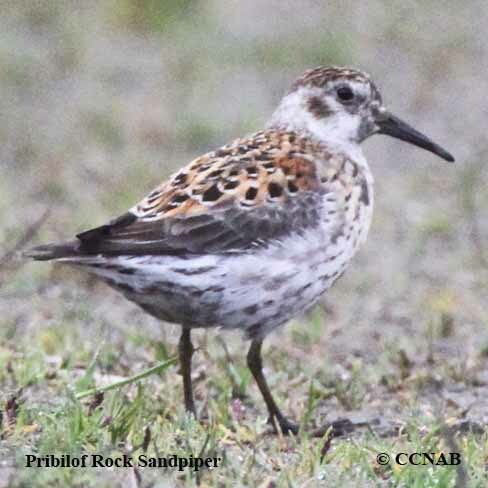 In the winter months Rock sandpipers can be seen along the coastlines from Southern Alaska to Northern California.